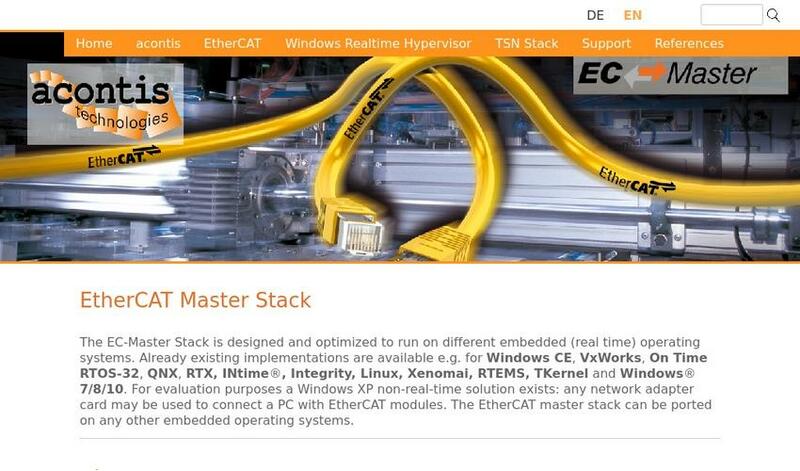 Since EC-Master V2.5 acontis technologies provides its EtherCAT Master Stack with support for Linux/64-Bit, Linux/PPC and Linux/32-Bit. 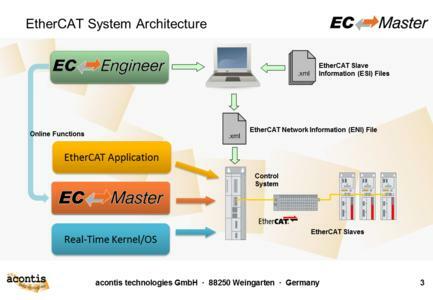 Using the Realtime Preemption patch for the Linux kernel, an optimized Link Layer for the network adapter and DC synchronization the EC-Master perfectly suits the requirements of sophisticated EtherCAT applications like Motion controllers. 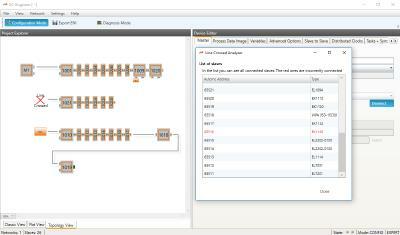 Connecting an HMI to the EC-Master Motion application can be easily accomplished using a Client-Server-connection. 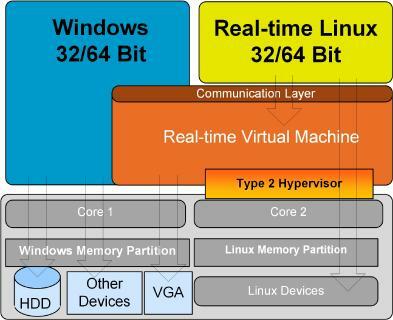 The common, but not only way is to connect an Windows based .NET HMI-application via an existing TCP/IP connection like Ethernet to the IPC. All diagnostic and service functionality can be platform-independently consumed at the HMI. An example for how to create an .NET service application comes with the EC-Master. 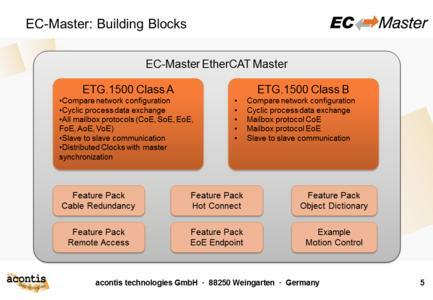 Configuring the network with the acontis EC-Engineer is probably the fastest and best way, but the EC-Master can operate with any EtherCAT network configuration file complying to the ETG.2100 ENI specification. The DC synchronization is just one functionality of the Class A license and can be combined with additional feature packs like cable redundancy and Hot Connect. Cable redundancy, Hot Connect and RAS combines robustness and comfort at EC-Master EtherCAT application usage and service. Supporting Linux/64-Bit, Linux/PPC and Linux/32-Bit acontis proves once again the portability of the EC-Master and paves the way for EtherCAT on Open Source Operating Systems. 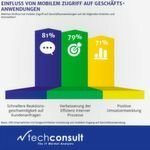 Acontis technologies, based in Ravensburg Germany, was founded in 2001 by the todays managers Christoph Widmann and Stefan Zintgraf. 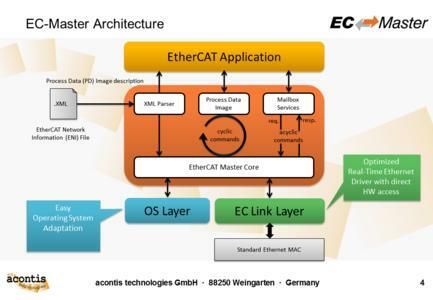 As a leading provider for EtherCAT® software and Windows® Real-time solutions acontis serves customers in the sectors machine builders, medical technology, automation, semiconductors and robotics. In the future, expansion in the EtherCAT and real-time businesses are plant as well as new investments in the area of Time Sensitive Networking and OPC UA.